Although work gloves, rock hammers, chisels, and protective goggles remain standard field equipment for fossil field work, electronic devices have become critical search tools. In both the Elko Hills and South Egan Wilderness, Vertebrate Paleontology Collections Manager Amy Henrici regularly referred to her iPad’s topographic map app which utilized a GPS function to provide accurate on-screen tracking of our movement across the landscape. Other sometimes overlooked field tools are described below. A rented Jeep Wrangler proved to be an indispensable field tool. 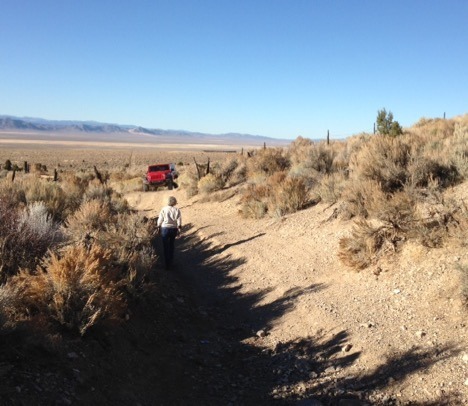 Unlike the high speed off-road travel depicted on television commercials, during a steep ascent from sage brush flats to the zone of pinyon and juniper we climbed in a low gear crawl. (Above) In places where the track crossed dry stream washes, it was sometimes necessary to scout routes into and out of the deeply eroded channels. Field notes add a layer of documentation to scientific fossil collecting. Details about localities, the field crew, the vegetative cover, and even the weather might prove to be important information for a future paleontologist re-examining a particular set of fossils. As an educator, the field work journal I kept doesn’t have direct association with particular fossils. 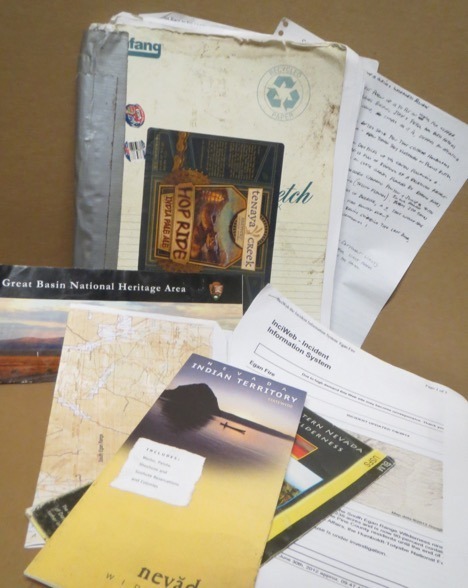 Instead the duct tape-bound notebook, which bears the label of a Nevada-brewed IPA, serves as portable file, holding hand-written notes, related maps, brochures, and reports. 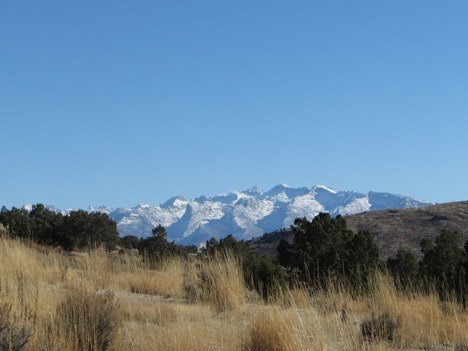 Nevada’s Ruby Mountains from the hills outside Elko. Because western scenery differs so much from that of east, a guide to the contrasts is useful tool, even for visitors focused on finding fossils. Observations by author Wallace Stegner aid in the appreciation of western landscapes. In a dry land the brinks of hills will be clifflike, not rounded; valleys will often be canyons; hills are likely to be buttes and mesas and barerock movements; the coloration will not be the toned greens of wetter regions but the red and ochre and tan and gray and black of raw rock, the gray of sagebrush, the yellow of dry grass. Patrick McShea is a museum educator who is traveling through Nevada with Vertebrate Paleontology Collections Manager Amy Henrici to search for frog fossils. He frequently blogs about his experiences.